Be your own boss. You do not need a sponsor. 354 of the required 394 hours are courses you complete at home at your own pace. Purchase with PayPal Credit and Get 6 Months Free Financing if you order online. We offer the 130 hours for $699 and the 200 hours for $699. Save $100 by purchasing them at the same time. Click Here to order the 330 hours and save $100. 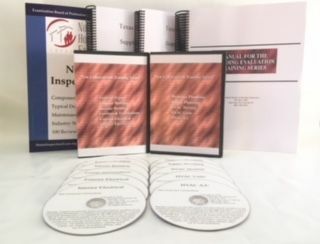 Bonus Material: Order the 330 hours and receive 21 bonus DVDs that expose you to almost 2,000 real life scenes and defects relating to home inspections and close to 2,000 issues on how homes are built. Also, complete all 330 hours and receive access to 5 full length practice state tests and several shorter tests. 3. 24 hours of an Experience Module course and 40 Hours of Ride Along with an Inspector on the TREC ride along instructor list (click here to see the list). We offer the 24 Hour Experience Module for only $199 if you purchase the 330 core hours. Complete this extensive video course in the comfort of your own home. No need to travel to sit in a classroom. *Options for the 40 Hour Ride Along: (i) We have identified some ride along instructors in the largest Texas cities who are willing to take our students on ride alongs ($300 to $650) or (ii) if you know an inspector with at least 5 years of experience, they can submit the form to get on the TREC list. Step B. Submit your application to TREC Once you have completed all the requirements, submit your application along with the completion certificates to TREC. Click here for the application. Step D. After you receive permission from TREC, schedule and pass your state exams with PearsonVUE. Click here for PearsonVUE. DVDs Exterior Electrical, Interior Electrical. These DVDs contain real life scenes from out on site. Bonus DVDs These 12 DVDs contain almost 2000 real life scenes and defects relating to home inspection from out on site. Core Course Books These books cover the topics required by the Texas rules. Proctored Final Exam (Required by Texas) Usually taken at your local library. Bonus DVDs These 11 DVDs contain real life scenes from out on site. Purchase both courses at the same time to save $100! DVDs What better way to learn than visually. Please note: According to Texas rules, you must have internet access to complete these course. Although we will be shipping the books and DVDs to you, you will be logging into an online program to work on and complete a course. Unlike online courses, you get to keep the DVDs and books to use as reference materials even after the course is completed. You have 1 year to complete a course. After that, you will no longer have access to your online account and cannot finish the course.